Universiti Tun Hussein Onn Malaysia (UTHM) aspires to lead in market oriented academic programmes which are student-focused through experiential learning. The campus is located in Batu Pahat, the southern part of Peninsular Malaysia. The University’s history began on 16 September 1993 with the formation of Pusat Latihan Staf Politeknik (PLSP), which trained experts in various fields of engineering. On 12 April 1996, PLSP was upgraded and known as Institute Teknologi Tun Hussein Onn (ITTHO). Subsequently, through its scientific and technological contributions, ITTHO obtained university status and became Kolej Universiti Teknologi Tun Hussein Onn (KUiTTHO) on 27 September 2000. 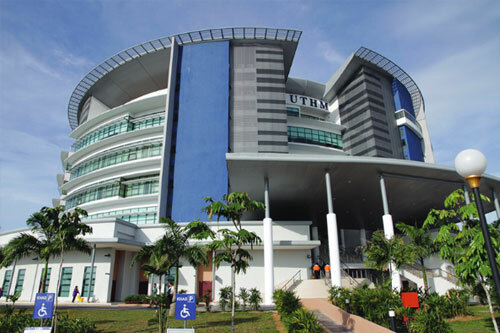 On 1 February 2007, KUiTTHO was renamed and became Universiti Tun Hussein Onn Malaysia (UTHM). The University is committed in its quality management services as proven by the MS ISO 9001:2008 certification awarded by SIRIM. Towards a world class university in engineering, science and technology for sustainable development. The education and training practice in this university focuses on a continuous effort to become the leader in market oriented academic programmes. These programmes are student-focused and are conducted through experiential learning in order to produce well trained human resource and professionals who are catalysts for sustainable development. UTHM offers courses that range from diploma to postgraduate levels. Undergraduate programmes offered at UTHM include Civil and Environmental Engineering, Electric and Electronic Engineering, Mechanical and Manufacturing Engineering, Railway Engineering, Computer Science and Information Technology, Technology Management and Business, Technical and Vocational Education, Science and Technology, Engineering Technology and Human Development. The diploma programmes offered include Diploma in Civil Engineering, Diploma in Electrical Engineering, Diploma in Mechanical Engineering, Diploma in Information Technology, Diploma in Civil Engineering Technology, Diploma in Electrical Engineering Technology, Diploma in Mechanical Engineering Technology, Diploma in Chemical Engineering Technology and Diploma in Applied Science. For postgraduate programmes, UTHM offers Doctor of Philosophy, Master Degree (by Research and by Coursework) programmes on full-time and part-time basis. The discipline areas include Civil Engineering, Electrical Engineering, Mechanical Engineering, Technical and Vocational Education, Technology Management, Real Estate and Facilities Management, Information Technology, Science, Education and more. UTHM’s library has 16,000 square meters floor area and can fill as many as 300,000 volumes of collections including 180,000 copies of books, 7,000 titles of thesis, 300 titles of journals, 40 titles of magazine, 20,000 copies of audio-visual material, 27 online database and 4 e-books services. Laboratory: A total of 70 laboratories complete with the latest equipment, machines as well as advanced computer software packages. Lecture halls: lecture halls, lecture theatres and lecture rooms, tutorial and seminar rooms that are fully air conditioned and equipped with teaching aids. All programmes offered by UTHM are fully recognised by the Malaysian Qualifications Agency (MQA), Board of Engineers Malaysia (BEM), Board of Valuers, Appraisals and Estate Agents (BOVAEA) and other related professional bodies. The University has established links with reputable institutions of higher learning in more than 11 countries such as Britain, United States, Australia, Germany, Brunei, France, Indonesia and the Philippines on academic collaborations, student as well as staff exchange, and research. Accommodation facilities include prayer rooms, rest rooms, and guest rooms, group study rooms, photocopying services, cyber café and more.